For use with incandescent and halogen bulbs only. Use Lutron's Maestro IR Dimmer and remote to adjust your lights from anywhere in the room, up to 30 ft. dim the lights to watch television, or bring them up to full brightness for reading, without leaving the comfort of your couch. The Maestro IR Dimmer includes all of the features of a Maestro Dimmer, including delayed fade-to-off, which can be activated using your hand held remote or directly at the dimmer. The delayed fade-to-off gives you 10-60 seconds to leave the room or get into bed before the lights go out. You can also recall your favourite light level with a touch of the silver button on your remote, or by using the tap switch on the dimmer. The LEDs on the Maestro IR Dimmer display the light level and glow softly in the dark, so you can easily find the control. Wherever you want to relax and control your own lighting environment, you will want Maestro IR dimmers. This kit includes the Maestro IR dimmer, handheld infrared remote and the matching Claro wall plate. 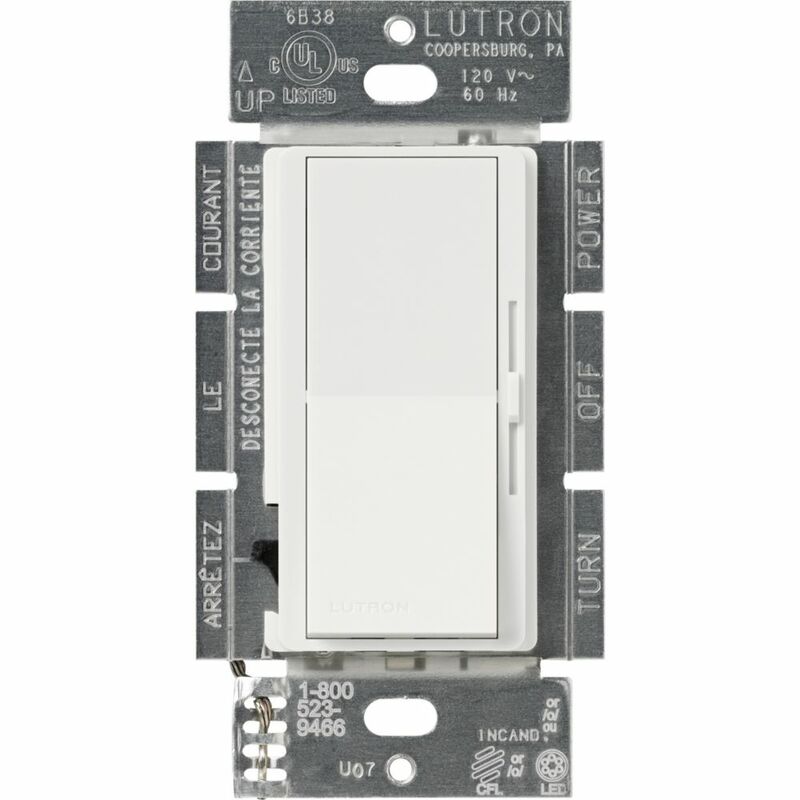 The Maestro ELV Dimmer from Lutron allows you to dim a light fixture from multiple locations. Use this product in 600-Watt Electronic Low-Voltage applications. The easy-to-operate tap switch turns lights on/off to your favorite light level or taps twice for full on. Press, hold and release the switch for delayed fade-to-off. Delayed fade-to-off gives you 10-60 seconds to leave the room or get into bed before the lights go out. Adjust the light level for any activity using the rocker. Using Maestro Dimmers and Companion Dimmers, you can control a single light from up to 10 locations - the perfect combination for controlling the lights at either end of the staircase or at both entrances to a room. Coordinating Claro wall plates and accessories sold separately. Diva 250-Watt Single Pole/3-Way CFL/LED Dimmer, White The Diva 250 Watt C.L works with dimmable LED and CFL screw-in bulbs up to 250 Watts and is also compatible with up to 600 Watts of standard incandescent and halogen bulbs, allowing you to control all 4 bulb types on the same circuit. It is designed to control a broad range of dimmable LED and CFL bulbs from a variety of brands including Philips, Cree, GE, Eco Smart and Lighting Science. With the same features as Lurton's Diva Dimmer, the large paddle switch turns the light on/off and returns to your favourite setting. The discreet slider adjusts the light level to suit any activity. Please see Lutron's Compatible Bulb List to view the current listing of compatible bulbs that work with this dimmer. Coordinating Claro wall plate sold separately. Diva 250-Watt Single Pole/3-Way CFL/LED Dimmer, White is rated 3.6 out of 5 by 5. Rated 1 out of 5 by HomeDepotCustomer from My led lights were humming 240W. I thought a 250W... My led lights were humming 240W. I thought a 250W switch would correct it. Didn’t happen. Rated 5 out of 5 by Catbert from First switch I've had that came with pigtails. No problem to install. Works great. Using it t... First switch I've had that came with pigtails. No problem to install. Works great. Using it to dim 19 12v LED track lights. Rated 2 out of 5 by MasterofDisaster from This switch will dim LEDs, but it makes them emit... This switch will dim LEDs, but it makes them emit an annoying buzz. I returned this and installed a Lutron DVRP 253. It works great, and there is no buzzing.